One finds every now and then something surprising in any installed Linux system. For several years I have known that with Emacs one can do just about everything one really needs to do with a computer. Well, at least if you don't want to edit video clips or compose music with it. 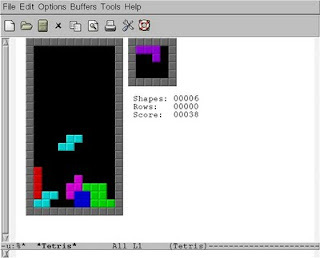 Today I realized that it is possible to play Tetris using the XEmacs of my Debian box. Just type ESC x tetris and you are ready to forget coding or writing your next article for the top journal of your field!